The Red Hat society was simply designed to celebrate friendships and to encourage lighthearted fun, creativity, and fellowship among women in middle age and beyond. Full members are fifty years and beyond and wear purple dresses with red hats. Women under 50 are welcome and are referred to as the Junior Postulates or "Pink Hatters" and wear pink hats and lavender dresses to events until they reach their 50th birthdays. The Birthday ladies (often) wear purpe hats. Both Red and Pink Hatters tend to wear elaborately decorated hats and use fun fashion accessories such as feather boas, bright scarves, etc. 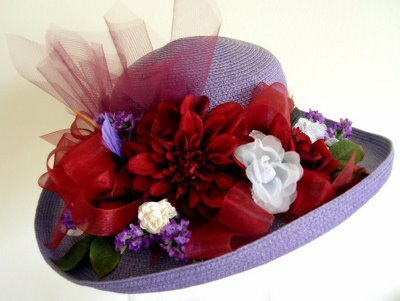 The hat I chose for the Red Hat tea RuthAnn prepared for me was purple and had pink flowers on it. Of course that wouldn't work, so I enjoyed an afternoon of shopping for trims to redecorate my hat. Red flowers, feathers, ribbon, and tulle were used to create a fun and funky hat! This hat decorating could get addicting! I was at my first red hat tea party a couple of weeks ago. It was an evening tea at campmeeting. It was wonderful getting to meet so many new people. I recognise some of the decorations in your pictures as being the same ones we had.